I love being able to take a look from a top designer and recreate it for a fraction of the cost, using everyday items. 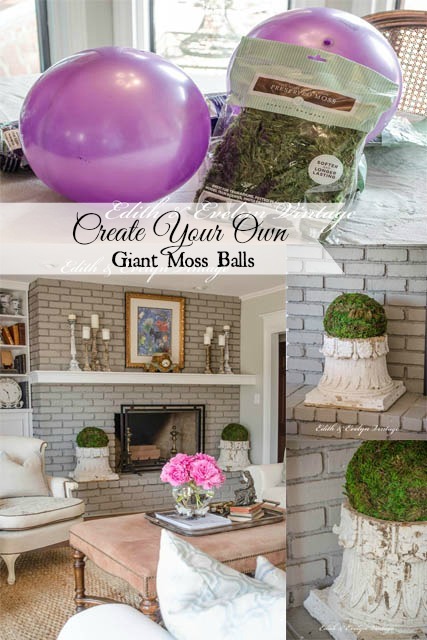 Two of my favorite projects that I recently completed for a “designer” look was our giant moss ball project, using children’s plastic balls from the dollar store, and preserved moss. I love them and they are perfect sitting on top of the old antique capitals that I’ve had for years. The other project, and probably the easiest I’ve ever done, was creating this cute sheep pedestal, out of toy store sheep figures. 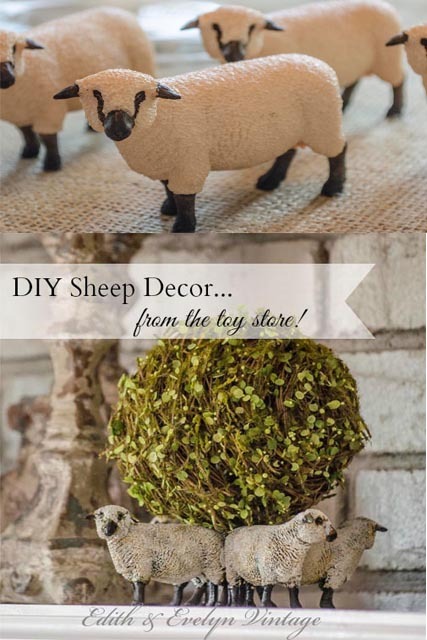 That little sheep pedestal is so versatile, and can be used in so many different ways. Hometalk recently asked me to put together a board of some of my favorite designer decorating hacks, and boy, was it hard to choose favorites, because there are so many great hacks out there! I was just amazed at all the creativity! But here goes! These are just a few of my favorite designer decorating hacks! This knock off of a Restoration Hardware chandelier is amazing! I love everything about Ballard Designs. And this knock off of their bird headboard is fantastic! And y’all know I love a pretty chair! this knock off, no sew, dining chair had me at “no sew”! I’ve only highlighted a few of my favorite designer decorating hacks. To see more, head over to Hometalk and check out a few more of the creative ideas! It just might give you some ideas of your own! Love the creativity of others to make such magnificent things and not pay the price! I don’t live near a toy store and am wanting to do the sheep project. I have seen some on ebay, however, no once answered me with the measurements. Can you tell me approx. how long and how high the sheep you used are? Thanks. Hi Nancy! The sheep are by the brand Schleich, and they measure 3.5″ long x 2 3/8″ tall x 1/2″ wide. You can order them on Ebay as well as from Toys R Us direct. A lot of the Wal-Mart stores also carry them in their toy section! Hope this helps!